The Dave Matthews Band’s A Concert For Charlottesville, in response to the recent events in the band’s hometown, will be livestreamed on Tumblr on Sunday, September 24th. The event is free for members of the Charlottesville and University of Virginia communities. The Live Nation event will be streamed through a media partnership with Oath, a subsidiary of Verizon. The event, hosted by Dave Matthews Band, will be held in their hometown at the University of Virginia’s Scott Stadium. Fans can tune in at musicandunity.tumblr.com beginning at 5:55 pm ET on Sunday, September 24th, as well as via other Oath brands including HuffPost.com, Aol.com, Yahoo.com, BUILDSeries.com, and on other social media platforms. “A Concert for Charlottesville” will feature Dave Matthews Band, Pharrell Williams, Justin Timberlake, Chris Stapleton, Ariana Grande, Brittany Howard of Alabama Shakes, The Roots, Cage the Elephant and special guests. The livestream will be co-produced by Oath Studios furthering Oath’s commitment to bringing live experiences that drive community to users around the world, and will be directed by Brett Ratner, award-winning film director and producer. 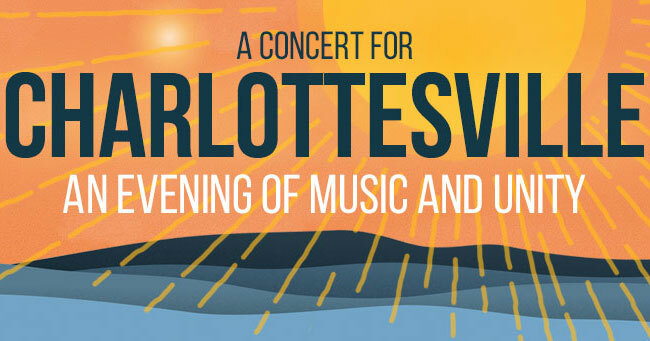 While tickets were free, attendees are encouraged to make a donation to the “Concert for Charlottesville Fund” at the Charlottesville Area Community Foundation. Beneficiaries of the fund will include victims of the events in Charlottesville on August 11th and 12th, and their families, first responders, and organizations devoted to the promotion of healing, unity and justice locally and nationwide.